Prepare for crowds. Bring activities to keep busy in lines. Strike up a conversation with your in-line neighbors, maybe learn a little about the people around you who traveled from far and wide to see this once-in-a-lifetime opportunity. These are just some of the tips provided by the Oregon Office of Emergency Management for the total solar eclipse that will sweep across the United States on 21 August. In some towns, like Hopkinsville, Ky., officials have been planning for a decade. Starting at 10:15 a.m. near Newport, Ore., the Moon’s orbit will align perfectly with the Sun, blocking out the yellow disk and leaving its sizzling corona in full view. The shadow will arc across the continental United States for the next 90 minutes, and the darkness will quiet birds, invigorate bats, and send chills down millions of spines. The 112-kilometer-wide “path of totality,” which refers to the swath of land darkened by the Moon totally covering the solar disk, will streak across 1,000 of the nation’s communities, many of them small and many of them rural. Towns include Madras, Ore., with a population of 6,700; Idaho Falls, Idaho, with a population of 60,211; Glendo, Wyo., with a scant 203 residents; Portland, Tenn. (12,522); and Santee, S.C. (923), among others. In some towns, like Hopkinsville, Ky., officials have been planning for a decade. In others, like Madras, city officials only heard word within the past 5 years. A hotel reservation inquiry from Florida first piqued attention in Madras in 2013, Joe Krenowicz, the executive director of the Madras Chamber of Commerce, told Eos. “It really never kicked in for me regarding the magnitude of the event and the impact to our area,” Krenowicz said. Once the magnitude of the event did set in, the city started planning. Meteorologists have pegged eastern Oregon as one of the best places to see the eclipse because of its cloudless summer skies. Estimates for the number of people expected to descend on Oregon hover around 1 million. Madras officials expect their city to grow by 40,000 over the eclipse weekend, but it may swell to 50,000–70,000 if inclement weather hits the coast and watchers try to rush inland, Krenowicz said. Even with the best estimates of hotel and campsite reservations, there’s no telling how many people will flood into Madras and the surrounding forests. “You are preparing for an event for which there is no RSVP,” Kassidy Kern, a public affairs specialist for Oregon’s Deschutes National Forest, told Eos. Madras secured more than 600 portable toilets 2 years ago and has already warned locals to do all their grocery shopping and other errands ahead of the eclipse weekend. Because Internet connections may be spotty, officials have also warned visitors to carry cash. And please, please, please—try not to set anything on fire. “I wish more people would listen to us” as the city prepares and pushes out preparation tips, Krenowicz said. Every day, he and other event planners repeat the same information: Arrive Sunday at the latest, and bring enough food and water for multiple days. Bring your own trash bags, and carry your trash home with you. Yes, you have to wear those special glasses because staring at the Sun during the eclipse (except during the short totality) is dangerous. The city may run out of fuel. “The biggest issue for [Oregon] is [the eclipse] is in the middle of the height of our wildfire season,” Kern said. Oregon last witnessed a total solar eclipse crossing a swath of the state in 1979, on a chilly February morning. Folks along the side of the road lit fireworks, Kern said. An Oregon February is cold and wet, but a central Oregon summer can roast in “triple-digit heat with single-digit humidity,” as Kern described it. In other words, it’s very hot and very dry. Oregon emergency services are even warning that cars driving onto grass could be enough to ignite a fire. In preparation, fire-fighting equipment will be already placed and ready around forested campsites, Kern said, because fire trucks can’t necessarily navigate winding, wilderness roads—or areas with no roads at all. In the 200-person outpost of Glendo, Wyo., the portable toilets alone “will cost $38,000,” said amateur astronomer Jackie Diehl, formerly of the National Solar Observatory in Sunspot, N.M., who has a cabin in Glendo. The town’s entire budget is $350,000. Between 77,000 and 100,000 people are expected to head to Wyoming for the eclipse. “We’re going to be running out of gas. The one ATM in town will run out of cash,” she said. The city has brought in extra ambulances and medical responders. It also requested volunteers from nearby towns like Casper and Cheyenne, each burdened with its own eclipse planning needs. Residents of Santee, S.C., with its population of 923, are excited about the economic boost they expect for their town, which sits along highway I-95, an accessible totality destination for people traveling up or down the East Coast. City officials have only known for a year that there would be an eclipse to prepare for, but they told local media that they’re looking forward to the influx of thousands. Hopkinsville, Ky., population 31,000, has been preparing for this event for a decade. The city has been dubbed “Eclipseville” because it’s located at the point of “greatest totality.” As the shadow creeps over Hopkinsville around 1:24 p.m. Central Daylight Time, viewers will be cast into darkness longer than at any other place in the country: a whopping 2 minutes and 41 seconds. City officials expect a $30 million economic impact from the expected 100,000 visitors over the eclipse weekend. They’ve even called on Governor Matt Bevin to deploy National Guard troops to help control traffic. So widely known is Hopkinsville’s perfect placement that even the director of the Vatican Observatory, Brother Guy Consolmagno, will embark on an almost 8,000-kilometer journey to Kentucky to witness the event. More than anything, these towns along the path of totality want everyone to have a good time. Madras’s Solar Fest features a music festival and science outreach programs at the local Lowell Observatory. In Hopkinsville, a bourbon tasting will accompany a 3-day music festival. “Everybody is talking about the eclipse because they see it as such a wonderful opportunity. It provides a unique, scientific experience for eclipse chasers from all over the world,” said Hopkinsville mayor Carter Hendricks. Still, stress is running high. 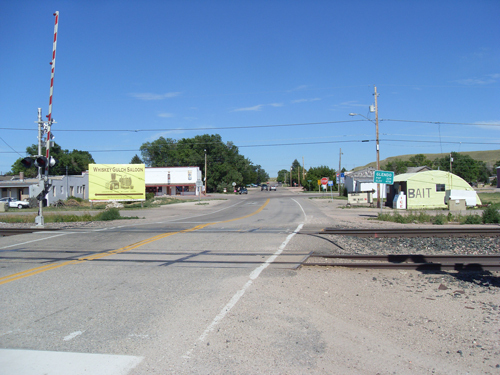 Correction, 18 August 2017: The article has been updated to reflect the correct population of Madras, Ore.
Citation: Wendel, J., and L. O'Hanlon (2017), Small towns brace for historic eclipse crowds, Eos, 98, https://doi.org/10.1029/2017EO079861. Published on 15 August 2017.